When a parent dies, it is not uncommon for a child to lose contact with that side of their family. When multiple generations repeatedly lose the parent from that same lineage, a disconnect from that side of the family is not surprising. Big Dollar's descendant tree could easily be described as an orphan tree. While we may never know why his descendants were forgotten by nearly everyone outside his family, it's possible the high percentage of orphans descending from him could be the reason. Sequoyah Guess (b. 1890) was an orphan. We know that from a previous post but he was far from being the only descendant of Big Dollar who was either left an orphan or who lost their Guess parent early in their lives. Big Dollar died when his four children were eleven years old or younger. While those children were raised by their mother, Tianna, at least one, Nancy, became an orphan before reaching adulthood. It's possible the others were completely orphaned as well. Records aren't available to conclusively determine when their mother died. It is also not known how much information about their ancestry from their father's side had been shared with them. Nancy, daughter of Big Dollar, lived long enough to raise her son, Peter Dennis, to the age of majority. Her brothers were not so fortunate. Robert died, leaving his two daughters, Nancy Nolen and Betsy Ketcher, orphans at very young ages. William died leaving at least two, possibly all of his children, Dave Guess, Nancy Sticks, and Alice Beamer, without their father before they were adults. Moses raised his son, Nelson, to adulthood, but left two other children, George Guess and Martha/Sa ke Boney, as orphans. 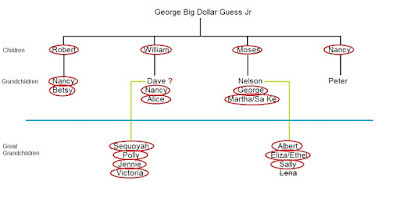 Over 75% of Big Dollar's children and grandchildren lost their parental connection with their Guess family before becoming adults. Sadly, the trend continued into the generation of great grandchildren. Dave Guess, son of William, left four orphans when he died, and Nelson Guess, son of Moses, left three orphans (plus one "too late" baby - to be discussed later), at the time of his death. 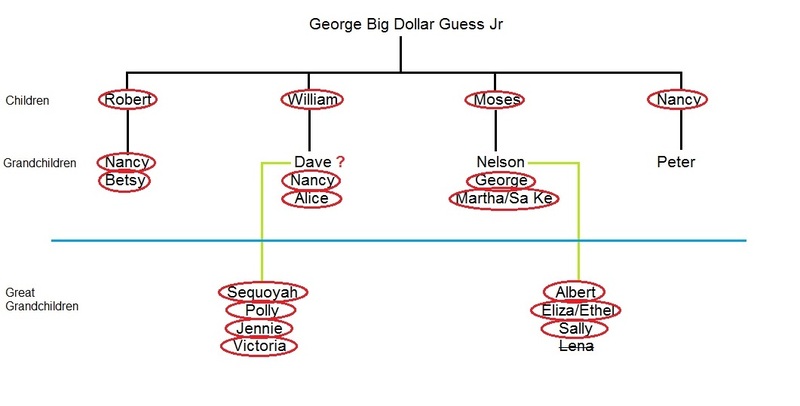 The image below identifies the descendants of Big Dollar, who as minors, lost their Guess parent. The tragedy is not just that they were orphans, but also that they were forgotten, not only by their extended Guess family, but also by Emmet Starr and some 'researchers' of today. As genealogists, it is our responsibility to ensure we have done a reasonably exhaustive search of records before we declare anything as fact. This is especially important before we proclaim that a person had no descendants. Each person in the diagram above has a story waiting to be told. It is our job to tell that story, not erase them from history by alleging they did not exist. While time does not allow for extensive writing about all of Big Dollar's descendants, records of their lives indicate that most were taken in by extended family and raised by Cherokees who looked out for them and their best interest. Sadly, that was not the case for all. There is one heartbreaking story that must be told. Not only does it serve as an example of how easily an orphaned Cherokee child could be exploited by unscrupulous people, it also exposes several instances of fraud either attempted or perpetuated against the Cherokee Nation by a deceitful, non-Indian couple. Stay tuned for more of The Lineage of a Cherokee Family where the sad story of one sibling group, the orphans of Nelson Guess, will be told.